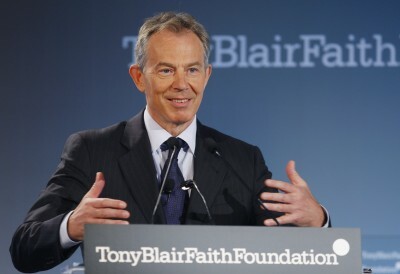 Blair was referring to the claim that Saddam’s regime possessed weapons of mass destruction, which was used by the U.S. and British governments to justify launching the invasion. But the intelligence reports the claim was based on turned out to be false. “There were different strategies for dealing with Libya and Iran. If the political context were right, people would support regime change.” So: Blair likewise wanted to overthrow the leaders of Libya and of Iran. So: Blair took some serious questions as being instead simply unquestionable, true beyond doubt. This fits in with his devout religious commitment. He respects faith: that consists only of unproven beliefs, and of the conviction that these beliefs should remain as beliefs no matter how weak the actual evidence for them is. “Jesus said to the faithful, ‘If you obey my teachings, you are authentically my followers; you will know the truth, and the truth will set you free.’” Blair is free: he is committed to The Word — not to reality. He’s free from reality, which can be figured out only by lots of careful work, which we call by the name of “science.” It’s a methodology above methodologies; and it demands lack of faith in anything, because it’s the exact opposite of faith, which is the opposite meta-methodology from science. He is the ultimate conformist. And he has become enormously successful as a result. He believed this even though he already knew that “the intelligence and facts were being fixed around the policy.” He knew, on 23 July 2002, that the “policy” (invading Iraq) was the goal, and that “the intelligence and facts were being fixed around” it. In other words: he didn’t even care whether Saddam really was a threat — Blair simply had faith in Bush, and was willing to send British soldiers to kill, and be killed, for that faith. Really? The wikipedia article “Casualties of the Iraq War” cites estimates ranging from 174,000 Iraqis killed, to over a million. The most scientific counts (and each of the studies is linked to there), the Lancet study and the PLOS survey, are both in the 500,000-600,000 range. Yet, Blair still says, “I find it hard to apologize” for having done that. The current residents of Iraq, as surveyed by Gallup, are the saddest people on Earth, or at least in all of the 148 nations they surveyed. And they’re also shown on page 7 to have the world’s “Highest Negative Experience Scores.” That’s an overall score on how frequently the residents experience pain, sadness, stress, and anger. Iraq is number one. In other words, they’re experiencing what’s probably the most miserable lives of any nation on this planet.